If you are experiencing continued foot pain, you may be suffering from Plantar Fasciitis. The foot is complicated. It includes 28 different bones and many different joints. To help control the position of the foot and stabilize the joints, there is an intricate system of muscles and ligaments associated with the foot, ankle, and back of the calf that have long tendons that cross the ankle and foot. These can have an effect on the foot and toes. There is another group of muscles located on the bottom of the foot. 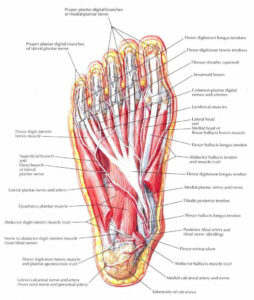 Additionally, just under the skin and over the top of the foot muscles is the “plantar fascia”. This is a very tough and dense connective tissue that runs from the bottom of the heel all the way to the toes. Beneath the plantar fascia the muscles are arranged in layers, and each muscle within each layer has a different job or function. For the foot and ankle to work properly, and to prevent pain and injury, these different layers of muscles need to glide freely over one another during normal use. Throughout the day we are on our feet a great deal. Over time, the muscles and fascia can become strained and fatigued resulting in small amounts of injury known as micro-trauma. The body responds to soft-tissue injury (including micro-trauma) by laying down small amounts of scar tissue to repair the injured tissue. Unfortunately, over time, this scar tissue will build up and accumulate into what are known as adhesions.